Ready yourself to delve into some history and hiking! This entry will explore the Cathar Castles, in particular a couple of lofty ruins which have been named the Languedoc’s ‘Castles in the Sky’. 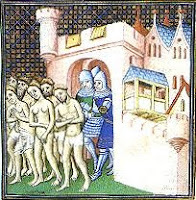 The inner circle of Cathar leaders, (named ‘Bonshommes’, or ‘good men’) fled the Crusaders by a route now known as the ‘Chemin des Bonshommes’. It was an arduous journey of 220 kilometres, from the Medieval town of Foix, over the Pyrenees and to the relative safety of Spain. On the way to Spain, they stopped at Cathar castles for shelter. 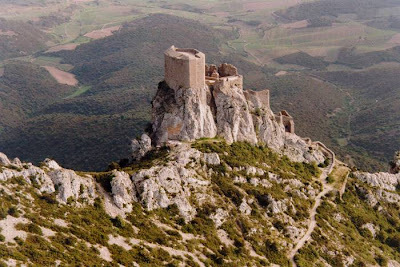 These Cathar castles were soon set upon by the Crusaders. Whilst the fortifications and geographical advantages of the sites held strong against the invaders, supplies eventually ran out and they were forced to surrender. The sieges and massacres that occurred during these Crusades were vicious and bloody — many atrocities were committed. Today we see the destruction and devastation of this group of people through the crumbling, stark, lonely ruins which still stand in the Languedoc region. 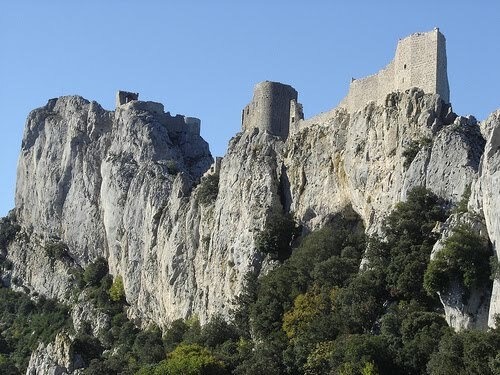 The hiking routes mostly centre around the atmospheric ruins of Cathar castles – picturesque and haunting, these majestic ruins sit starkly on the summits of rocky mountains. Their position was chosen for strategic military reasons and today we can enjoy these vantage points for their incredible views of the surrounding land. There are many sections of the Cathar route which you can explore: the entire ‘Chemin des Bonshommes’ route takes around twelve days to complete on foot! But if you’re looking for something a little more relaxed than a 12 day hike, we suggest renting a villa in the area and exploring sections of the route at your leisure. 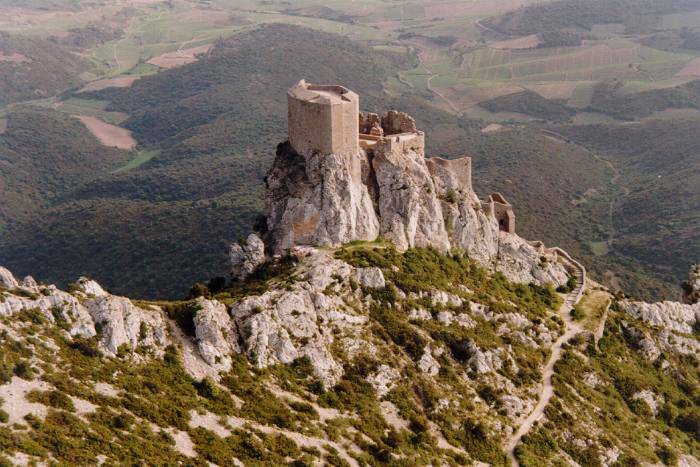 Peyrepertuse (meaning ‘Pierced Rock’)is a ruined fortress, perched at a lofty 800m in the Pyrenees. Peyrepertuse clings to a narrow, rocky ridge 70 metres wide and 300 metres long. Its precarious position makes you wonder at how such an architectural feat was possible back in the Middle Ages. How did they manage to haul building materials and construct the Castle all the way up there? 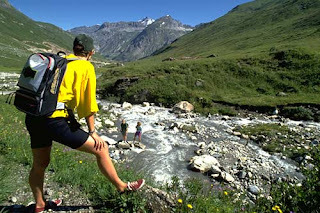 It’s enough of a hike as a tourist carrying only a digital camera and a bottle of water! But the exertion to reach the summit is definitely well worth the effort. Not to mention that the scenery on the way to castle is delightful in itself — it is a winding route with lovely trees, rocks and wild flowers greeting you around every twist and turn. Nearby, you’ll find the smaller castle at Queribus. It is a shorter walk than the climb to Peyrepertuse, but steeper. The views are less dramatic here, but it makes up for this with the interior of its castle which is the more interesting and well-maintained of the two. You need good walking shoes for both these walks, but you don’t need to be an Olympian to attempt them. In fact, if you take it slow and steady, you don’t really need to be very fit at all! Another must-see in the region is the city of Carcassone — you can read all about it in an earlier blog entry here. The owners run an organic 12 hectare wine domaine from a wine ‘cave’ next door – so no need to travel far for a wine tasting! The villas are typically French, built in the early 20th century – although since then the owners have renovated them to include modern conveniences, such as ensuite bathrooms. If you don’t want to spend all your time hiking, there are plenty of other things to do in the region also. Nearby to Cascastel you can find beaches, canoe hire, bike hire, golf, horse riding, hang gliding, boules, vineyards, a African Safari park and more! Also there are some great historic towns to discover, such as Narbonne, Carcassone, Beziers and Montpellier. We hope we’ve inspired you to discover this wonderful part of South France – if you have any enquiries please VISIT OUR WEBSITE www.southfrancevillas.com. We’d be more than happy to help!